The People's Convention and their posters in Cork City Hall. A MEETING OF CORK City Council had to be abandoned this evening, after a protester occupied the chamber and refused to leave. 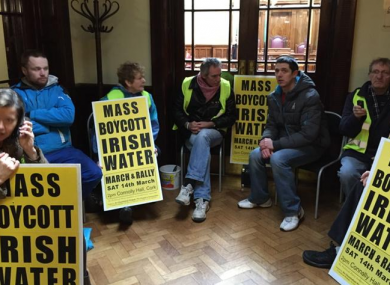 Members of The People’s Convention have been occupying Cork City Hall since this morning. The activists are in an ongoing dispute with the council over the removal of their posters from poles in the city – and claim that the situation has come to a head in recent months. Protester Diarmaid Ó Cadhla entered the chamber as the meeting was supposed to begin at 5.30pm, and said he wouldn’t leave. The session was abandoned, after first being suspended for fifteen minutes. Speaking to TheJournal.ie, councillor and former Lord Mayor John Buttimer said that in such situations it’s “virtually impossible to proceed” with a meeting. Gardaí attended for a time, but were in an “invidious position” according to Buttimer. Due to the presence of the other protesters, they couldn’t predict what might happen if they made an arrest, the Fine Gael councillor said. Buttimer said that members and council management would now have to make a decision on how future meetings would be conducted – stressing that the ”health and safety of staff” would have to be taken into account. The council now has a huge backlog to get through, he said – and waiting until the next scheduled fortnightly meeting in two weeks’ time would not be ideal. Speaking to TheJournal.ie earlier, Ó Cadhla said the protesters were demanding their “legal rights”. Today’s action was being staged, he said, ahead of an anti-water charges protest being planned for this Saturday, organised by in part by The People’s Convention. Ó Cadhla claimed that notices advertising this protest have been removed by the Council and that that the group were not informed of the removal. We are demanding our legal rights, we have the legal entitlement to posters. They say we are putting them up on in private property. Asked what kind of “private property” they were referring to, Ó Cadhla said that it may be ESB poles. He argued, however, that “since the foundation of the State” such ESB infrastructure has been used to advertise political events. The council argue that, while notices for public events are exempt from litter laws, prior authorisation must be given by a property owner before the notices are erected. There has been a growing trend of posters being erected, in particular, on lamp standards, traffic poles, etc. There has been a perception that as these are in a public realm that there is freedom for all to use them for displaying purposes. This is not the case. Whilst display of meeting posters within certain timeframes is not an offence the Local Authority, in the absence of advance authorisation, s entitled to remove such displays. Email “Council meeting called off AGAIN as protester refuses to leave chamber”. Feedback on “Council meeting called off AGAIN as protester refuses to leave chamber”.